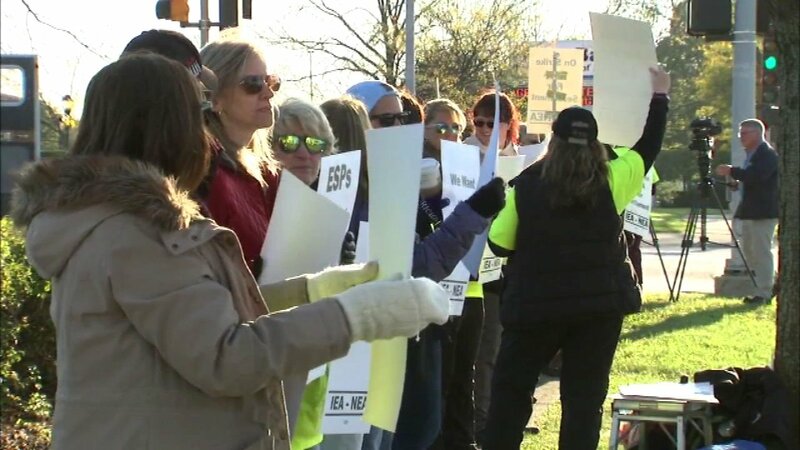 PALATINE, Ill. (WLS) -- Dozens of striking school employees in northwest suburban Palatine went back to work Monday morning, but their union was not happy about the circumstances. Support workers at Palatine Community Consolidated District 15, including secretaries, program assistants, nurses and sign language interpreters, walked off the job two weeks ago. The Educational Support Personnel Association, which represents the employees on strike, said over the weekend the school district declared an impasse and is trying to enforce what's being called a "last, best contract offer." The union said the fight will move to the courts. "We are extremely disappointed by the board's action so far, but we are anxious to get back to the students we love," said Bridget Shanahan, spokesperson of the Illinois Education Association, which is affiliated with the ESPA. "We fully intend on moving forward with good-faith negotiations and hope that we can find a solution that works for everyone," said Morgan Delack, a spokesperson for the school district.